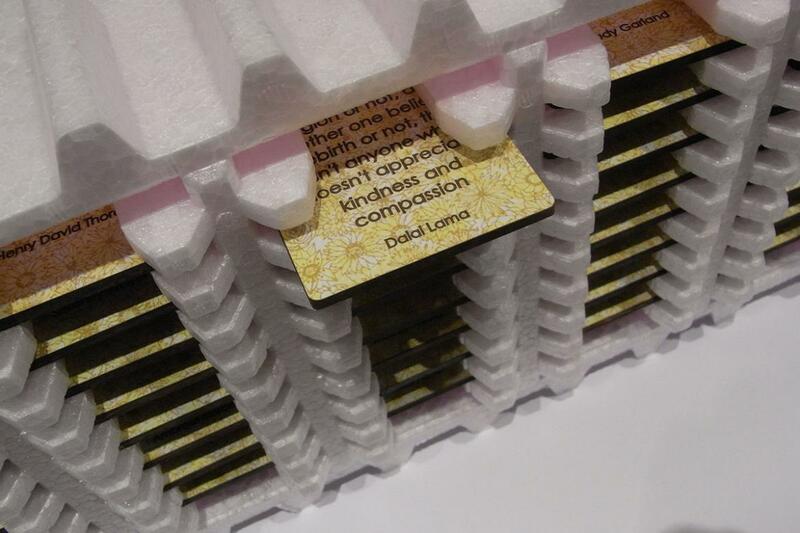 Hidden Harmony is an 'affirmation station' made of laser cut and etched Formica rectangles, housed in a polystyrene ex-computer packaging shell. Both materials were destined for the landfill. The yellow print (1970s) Formica sheets were to be removed from the kitchen walls in a planned house renovation project. The pink polystyrene shell was found abandoned in a corridor in a government building. Kinder on the environment, reducing the waste stream by recycling through reuse. Softer on materials, reinvesting embodied energy to redeem and reinvigorate discarded surplus objects. Sweeter solutions that delight, inspire and meaningfully contribute to the experience of everyday life. Stop… select a card. It will introduce a thought for your day, which may make you laugh, kiss or raise an eyebrow. The cards contain positive affirmations and thought provoking comments, which are pleasing to remove from their slot, and satisfying to return; rather like clocking into a good headspace. Material: Pink Polystyrene ex-computer packaging shell, Formica all panels.